Broxtowe Borough Council appoint a Youth Mayor each year and this year 14-year-old Alfie Russell took on the role. 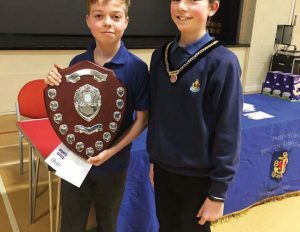 Away from his council duties, Alfie is a member of 17th Nottingham Company, and the Company was pleased that he could do a couple of Company functions in his role as Youth Mayor. He attended the annual pantomime ‘Cinderella’ and went behind the scenes to meet the cast and also presented the awards at the Company Annual Presentation evening.